Using a PRO-680DN100 box CCTV camera, this video demonstrates 6mm and 100mm lens settings using the 5-100mm vari-focal auto-iris lens. This video demonstrates the angle of view and zoom level that could be achieved using a Box CCTV Camera with a 5-100 mm varifocal lens. The garbage dumpster is located 100 feet away from where the camera is mounted in these two videos. The video on the left shows the angle of view when the lens is set to a 6-mm setting. The lens can be set about another 6- to 8-degrees wider than this if it is set all the way out to 5 mm. The video on the right shows the camera lens adjusted to the most narrow and zoomed in 100-mm setting which, as you can see, brings the view of the garbage dumpster in very close up. In the 6-mm video, the man approaches the camera and stops 13 feet in front of it. A 5-100 mm varifocal lens can easily be adjusted to any zoom level within this range. This give security system installers a lot of flexibility to adjust the camera view to the exact view that is needed. For more information on the Pro-680DN 100 Box Camera and lens that was used in this video, please visit www.cctvcamerapros.com/PRO-680DN100. 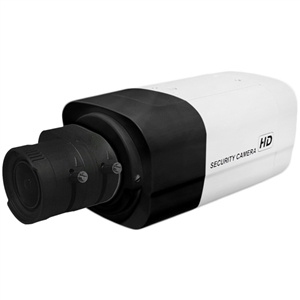 Click here to learn more about the PRO-680DN100 CCTV Box Camera used in this video.